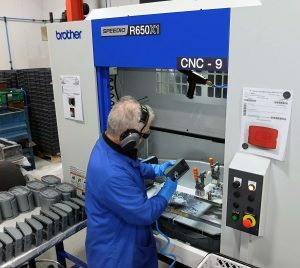 Zinc and aluminium high-pressure die casting specialist RD Castings has used Japanese-built, high-speed, twin-pallet machining centres from Brother since 1989 and currently has nine of them adding value to its products in two machine shops in Mildenhall, Suffolk. Since the mid-90s, the 30-taper machines have replaced manual milling, drilling and tapping, which was both labour intensive and subject to quality variation. Running the company are siblings Anthony and Michael Pateman, who were interested when Brother’s UK agent, Whitehouse Machine Tools, suggested they see a demonstration of the machine manufacturer’s new ISO control with 12-inch colour LCD screen, the CNC-C00, a significantly faster and more user-friendly CNC system fitted to its latest machines. 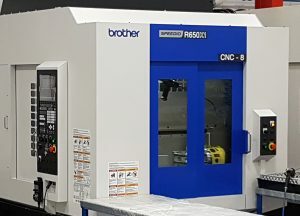 After they visited the agent’s Kenilworth showroom and technical centre at the end of 2016, they came away not only with up to date information on the new control’s capabilities, but also having ordered another Brother machining centre, a Speedio R650X1 with Nikken rotary 4th axis. It was not their intention before the visit, but the machine was so productive and such a good fit for RD Castings’ needs that they placed the order on the day and invested in a second identical model within six months. Numerous facets make the machine particularly applicable to machining light castings, one being its outstanding speed. 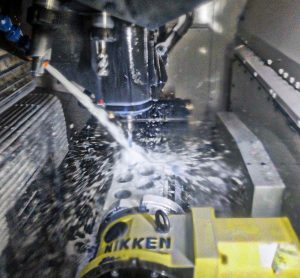 Workpiece changeover is completed entirely within the 3.4-second rotation of the twin-pallet Quick Table, as the 21-pocket magazine’s 0.9 second tool change time, 50 m/min rapids in X Y and Z, and rotation of the 4th CNC axis are carried out simultaneously. The first tool is ready to cut the next component immediately it arrives in the machining area and little time is wasted on each subsequent exchange of the cutter due to the rapid tool-to-tool time and spindle acceleration from zero to 16,000 rpm in 150 milliseconds, with similarly fast stop time. 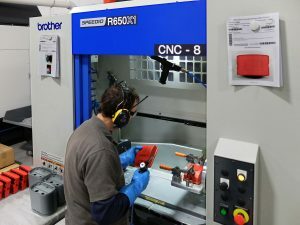 Michael Pateman commented, “The speed of tool change on the R650X1 mirrors that of our Brother 324N and R2A machine models, where the tool carousel encircles and travels with the spindle, which does not have to move away to pick up a new cutter as on the Brother TC32A and 32B machining centres that we also have on-site. Anthony Pateman pointed out another advantage of the R650X1, namely the generous axis travels of 650 x 400 x 305 mm in X, Y and Z. The table accepts RD Castings’ 500 x 350 mm base plates on the trunnion fitted to both machines, allowing multiple components to be fixtured for 2-axis and 3-axis machining, relieving the load on the 324Ns and R2As which are always filled with work. To underline this comment, he pointed to a casting of about the size that used to need a second operation but is now machined in one 4-axis process, saving 70 pence per part. Simon Hale, CNC machine shop manager, stated that productivity of another part – an aluminium die cast housing for the rail industry – has been nearly doubled using the larger machine compared with the other Brother models with similar tool carousels. 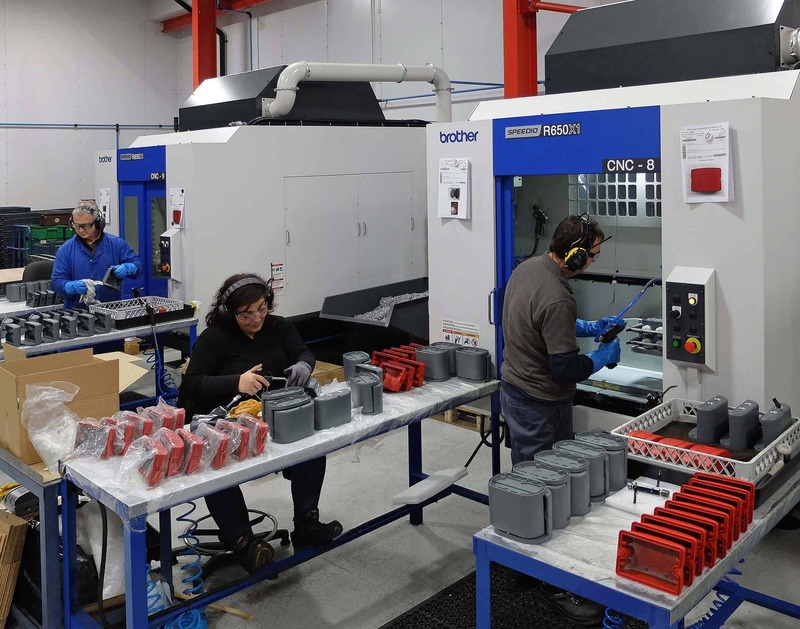 17 castings per hour were drilled and tapped using 12 tools on the latter machines, whereas using a trunnion fixture on an R650X1, 32 parts per hour come off the machine after each pallet rotation and just eight tools are needed. He summed up, “By employing ultra-high-speed machining techniques on 30-taper rather than 40-taper machines, with extensive use of polycrystalline diamond inserts clamped in dynamically balanced tool holders, the cost of producing a casting is now about the same in Mildenhall as it is in China – and we are winning back business as a result.